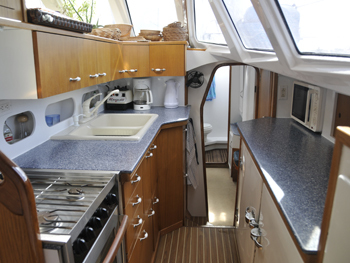 BREANKER accommodates 8 guests in 4 identical cabins, each with Queen size berth and private, ensuite bathroom. 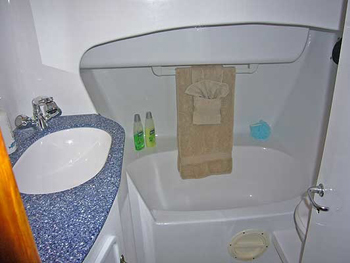 Two bathrooms have a shower and tub; the other two just have showers. 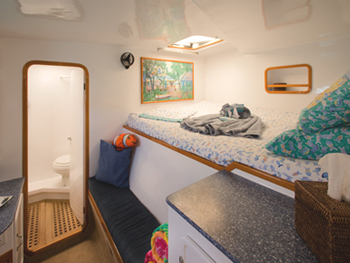 The crew of two are self contained forward and have their own bathroom. SCUBA gear for certified divers only. 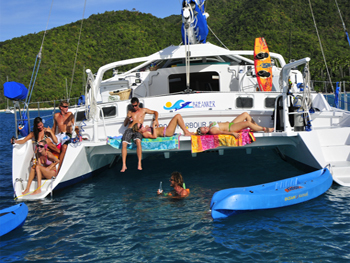 Available year round from St. Thomas, the 55’ Simonis catamaran “BREANKER” is one of our most successful charter yachts in the Virgin Islands. 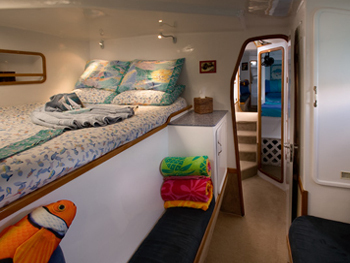 It’s a big “cat” with plenty of room for eight guests available at competitive rates (for her size), and the best thing about BREANKER is her crew, Kristian and Marianne from Denmark. 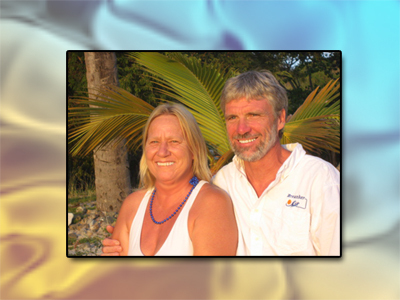 It seems strange to say they come from Denmark, because Kristian and Marianne arrived in the Caribbean 25 years ago on their home-built, 65’ monohull, Casador, which Kristian had just finished building. So they seem more Caribbean-ish than Danish…. Let me say how beautiful their monohull was that they built. We inspected it and met Kristian and Marianna when they first arrived 24 years ago…. It looked like it could have been built by a factory, it was so beautifully built and designed, and it was modern looking too, way ahead of its time…. 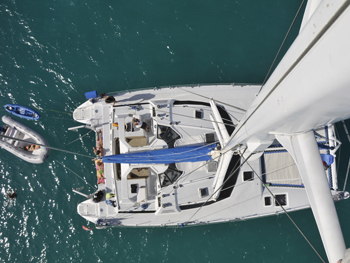 They sold it, and bought BREANKER a few years ago…which Nicholson clients have been chartering with great joy ever since. Kristian and Marianne are born hosts. 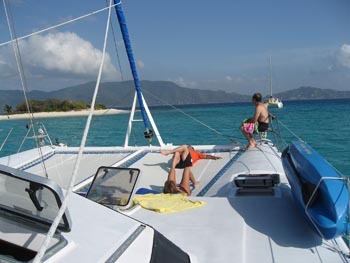 They are naturals at yacht chartering. Extremely warm people of the sea, it’s obvious that Kristian and Marianna enjoy what they do, because they’ve been doing it so well for so many years; they never tire…. 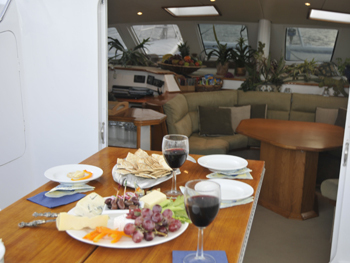 Guests feel welcomed and relaxed aboard. 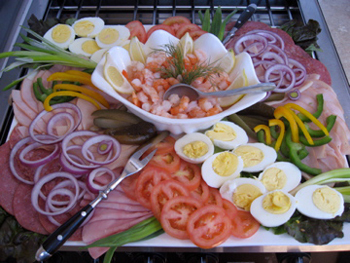 Nicholson clients have said that they have enjoyed the food Marianna prepares – there is lots of it – salads, all sorts of wonderful fare…. 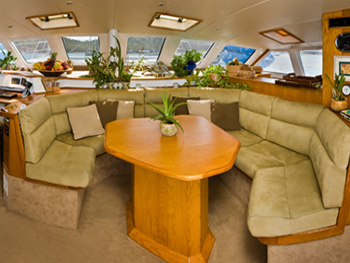 BREANKER has four equal guest cabins, each with Queen berth and each with adjoining bathroom, ideal for four couples….or families of five…. The yacht is air conditioned but you honestly do not need air conditioning at anchor. The trade winds blow; BREANKER has many opening hatches, and it’s nice to be able to leave the doors and hatches open and feel the breeze. 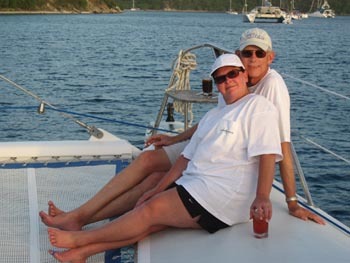 If they were going into a marina where the yacht can’t swing into the breeze at anchor, they would leave the air conditioning on all night….but anchoring is usually out in the bay, where the breezes blow. They will run it all night for a fee of $50/night. BREANKER’s guest cabins do not have television, but the saloon does… They have 50 DVDs, as well as a CD player in the saloon…. 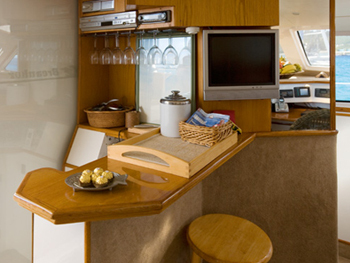 The yacht also has a water maker and a 400 gallon water tank…. When Kristian runs the generator in the evening, the yacht is also making water…. 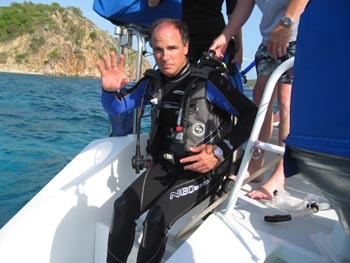 There is dive gear aboard for certified divers; Kristian dives with guests, but he is not a dive instructor; Diving is included for up to 6 certified divers, gear rental is $150/diver/week….and there is internet and 110 electricity. BREANKER offers lots of sports equipment: 14’ inflatable dinghy with 40hp outboard, adult water skis, 2 Stand Up Paddle Boards, knee board, snorkel gear, wake board, 2 kayaks, beach games, floating mats, fishing gear, SCUBA gear for certified divers only. 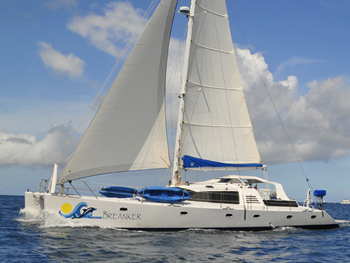 BREANKER sails from St. Thomas and has an ongoing special: $1,000 off any charter booked within 60 days of start date (but you’ll have to be flexible in dates, because BREANKER gets lots of bookings). 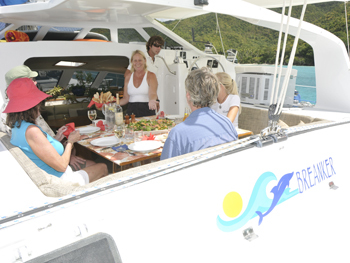 Rates include captain, chef, food, fuel, bar, dockage – sails from Tortola. Rates are quoted for the party as a whole. 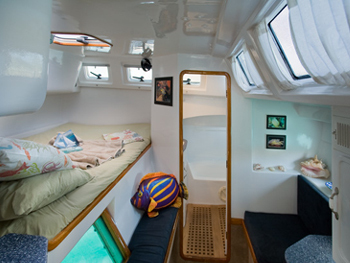 Rates for 5 and 6 guests using 4 guest suites are: $18000 for 7 nights aboard.Diving for up to 6 guests is included. Gear rental is $150/diver/week$1,000 off on short notice bookings (ie: confirmed 60 days or less from date of boarding) Not to be combined with other offers. Please do not combine specials.